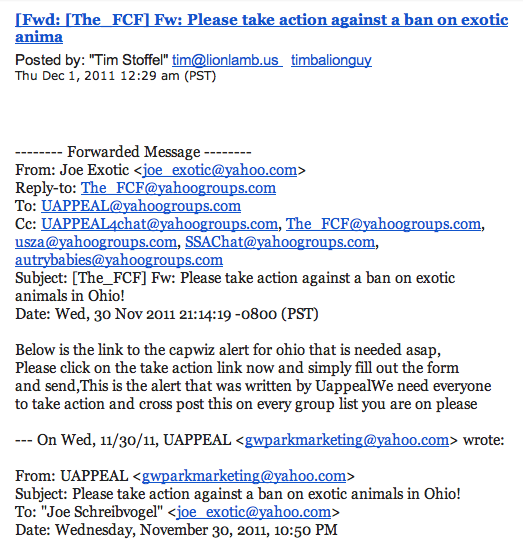 This press release issued by Joe Schreibvogel about the Feline Conservation Federation and Lynn Culver exposes their thinly veiled attempts to fool the public into thinking they provide a needed service. Joe is no stranger to controversy though and the Internet abounds with undercover video of the suffering his cats have endured including a lioness with her arm chewed off by tigers and no vet care. 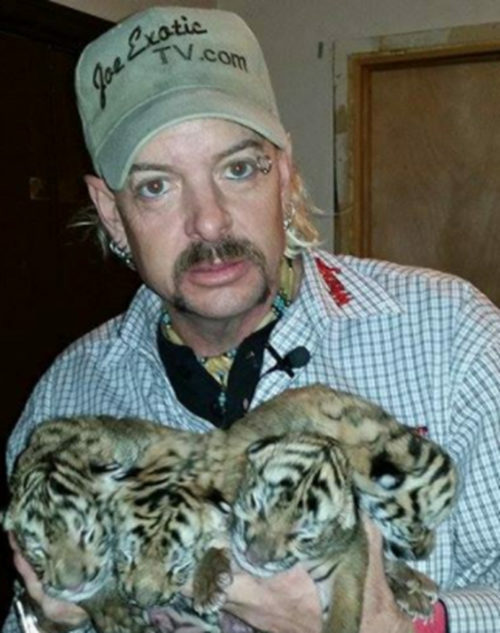 He claims to have “re-homed” 22 tigers into a cage that cost 21,000, but a decent cage for one tiger costs 7500.00. Visit in person, get behind the scenes to see how the cats are really kept, and then decide. This press release is just the pot calling the kettle black. /24-7PressRelease/ – Wynnewood, Oklahoma, September 08, 2008 – The Florida incorporated organization Feline Conservation Federation, better known as the FCF, finds itself in a whirl wind of controversy. Due to the lack of interest from the FCF in this rehoming project, Mr. Schreibvogal took the project on by himself and spent more that $21,500 of his own money to build enclosures and pay for the transportation costs to bring 22 of the Wesa-Ah-Gee-Ah animals to his GW Exotic Animal Park. He then found homes for the remaining animals and helped those who took in these animals to make preparations for their arrival. A week after the rehoming of the animals from Warrenton, Mr. Schreibvogel started getting emails relating to the Warrenton situation and he found one that was most disturbing. A woman out of Arkansas sent this email on August 31, 2008 to Mr. Schreibvogel that said “I got a desperate call from someone who attends church with Sandra (owner of Wesa-Ah-Gee-Ah) wanting help in placing these cats. Because I was so busy with school, work, and a new baby, I contacted Lynn Culver. I figured as president of the FCF, she should help or at least put Sandra in touch with someone who could. Apparently FCF did nothing. That was months ago. If Lynn had not ignored the situation, that accident could have been prevented and that boy would still have his leg. Just another example of FCF offering all kinds of help to owners, and providing none.” Could the tiger incident have been prevented if the FCF had taken action when they were first made aware of the problem? Schreibvogal says he is puzzled by all of the misinformation in the media about the incident that caused the injury to the worker at the sanctuary. One report indicated the cage was 17 feet tall when in fact it was only 10 feet tall. “They are making these animals sound much more dangerous than they are, and this tiger was in a poorly constructed cage. Tigers don’t make a habit of just climbing out to get out. There are always factors behind any incident.” Schreibvogel stated that this was indeed a sad accident but he was told by an eye witness at the scene of the accident that the tiger was provoked by a volunteer at the top of the cage who taunted the tiger with a piece of chicken which gave this tiger the incentive to climb up the side of the cage. Schreibvogel said “There are already regulations in place in Missouri to cover the ownership of animals and if they are not followed things like this can happen. Missouri doesn’t need any new laws, they just need to enforce the ones they already have in place.” The FCF has now had complaints filed against them for fraud of selling memberships with advantages and than removing certain privileges as they see fit with no refunds offered to people buying memberships. The creditability of the registered feline handlers cards they also sell is under scrutiny as one member puts it a kangaroo could sign up for this, it’s not about professionalism its about $30.00. In the last month one board member has resigned, and over 30 memberships have been either suspended or revoked due to people questioning the ethics of the Organization. All information contained in this article was through direct dated emails, or personal conversations with the people involved.